More Website Templates @ Peace July 30, 2012! "THIS IS A PATH OF NON HARM TO ALL"
A Tribute Page Dedicated to Robert Adams Pure Form Discourse and Life Long Love of Animals. Robert Adams filled his home with beloved animals throughout his life, instructing his children to teach on the true nature of "The Animal Kingdom" and how to become a vehicle of compassionate reverence, respect and wisdom, as shred in "Talks With My Father". Robert Adams maintained a life long humble participation in the support and establishment of animal rescue and protection projects and organizations. He gave Inner Circle Discourses in his home with his animals at his feet, in warm humor, respect and protection. "You must have a great compassion for the Animal Kingdom." Robert Adams is heard singing along. Join in The Peace Song of Saint Francis more see chant recording. "Your spiritual stature is shown by your love for all living beings. By your love for the animal kingdom. You feel the same love for the animal kingdom as you do in all pervading, love omniscient, bliss consciousness. The same Supreme Self, God, Omniscient Reality, is in all. Your actions then begin to reflect this love, this compassion. You wish to go out of your way to assist the animal kingdom, to protect them. This is your natural state. You were created to live in harmony, in non- harm, ahimsa, with the Animal Kingdom." The love of animals in harmonious beauty, gentility and deep sacred respect, is a primary aspect of the Message of the great Sage, Robert Adams. Residing in the modern American suburbs in a multi-generational Indian style family complex, hundreds of people received his beloveds wife's introduction to the complete educational integration of animal compassion, a delicious non harm based diet, and the bodies absolute lack of requirement for meat from a nutritional fact based foundation. Guest: Robert, is there a reason why you are a vegetarian? Does it have a practical benefit in your practice? Robert: There are so many ways to explain that. When I was about thirteen years old, I had eaten meat until that time. And then one day my mom gave me a steak, and I just blurted out, "I don't eat dead flesh." And I've never eaten it since. Now if you're in the body, and you believe you are the body, you have to look at the moral reasons. What right do we have to kill these thousands of cows and pigs and chickens, so we can stuff our face with dead flesh. Think about that. Right now there are cows standing in line to get killed. McDonalds alone uses a million cows a year. All these cows are grown and they put them in a feedlot, and torture them with all kinds of antibiotics, and then slaughter them, so we can eat them. Morally it doesn't seem right. It's been proven a pig is smarter than a dog. It makes a better pet. Would you like to see your dog or your cat slaughtered and people eating them? You have preference. All animals are the same. On one level, the reason the world is degenerating is because of what we’re doing to all of the animals and the earth. But that's on one level. So, you have to take it for what it's worth. Student: You know, we see in the zoo, we see them feeding one animal with another animal, and you give your dog meat. And you say, well my dog can eat meat, why can't my husband? Robert: No comment. (Audience guests banter among themselves). Student: Her husband doesn't bark. Robert: (Here Mr. Adams interjects.) Well, one thing leads to another. Because of ecology reasons the animals know how to take care of themselves and eat certain other animals, to balance everything out. But human beings are mercilessly killing animals for the fun of it. We think we have to eat animals, but we don't. Humans are not supposed to be carnivorous. You want me to prove it to you? Look at your teeth. Now look at the vegetarian animals that don't eat meat and look at their teeth. Like horses, cows, elephants. They have teeth like ours, gorillas. But when you look at your carnivorous animals, they have fangs, to tear flesh apart. This shows us that we're supposed to be vegetarians. We come from the animal family of vegetarians. You know when man started to eat meat? In the old days during the floods, thousands of years ago. Prior to that, man was vegetarian. But the floods destroyed the earth. It was impossible to plant, and man degenerated and started to eat meat. We've been carrying on ever since. It's a personal thing. You've got to look at yourself, and see what you're doing, and ask yourself, "Why?" 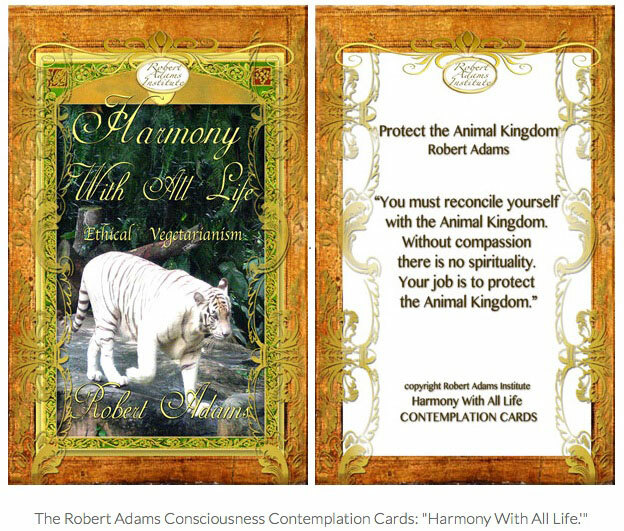 Robert Adams walked in close, touching and devoted dedication to the animals, contributing to several animal welfare groups, and adopting many animals raised in deep spiritual communication and natural spiritual healing. Together with his daughter, they released several dialogues and publicly published articles on animal compassion and spiritual unfoldment, remaining lifelong activists for animal protection, spiritual understanding and intelligent respect. "If you really had compassion, could you eat meat? You absorb the suffering, the pain, the terror of the animal. "What right do we have to kill these thousands of cows, pigs and chickens so that we can 'feed our face' with dead flesh? Think about that. Right now, there are cows standing in line to get killed. All these cows are grown, and then they put them in a feed lot, (and) to torture them with all kinds of antibiotics; then slaughter them, so we can eat them. (*" The body does not require meat to survive, to be healthy. If you really had compassion, could you eat meat? ")Morally, it doesn't seem, is not right. "ALL ANIMALS ARE THE SAME. "It has been proven that a pig is smarter than a dog. It makes a 'better' pet; Would you like to see your pet dog or cat slaughtered; and people eating them? You have a preference. All animals are the same. " Human beings are mercilessly killing animals for the fun of it. We think that we have to eat animals, but yet we do not. It is a personal thing. You have got to look at yourself, and see what you are doing, and ask, 'Why?" Robert Adams responds to the imagery of a student saying incorrectly, "Well, nothing 'exists' anyway so what is the difference?” Robert Adams responds: "God as the world is real. ""If 'nothing existed' , you would KNOW not to eat meat before that, and you would not do it anyway;If you realized that 'YOU' are not the body, YOU would not eat animal bodies. But you have to come to that conclusion yourself. "Your Body is not a Graveyard. What right do you have to hurt an animal? "Even as a child I could not understand how anyone could hurt an animal." "If you really had compassion, could you eat meat?" You must have a great compassion for all living beings. It's not good to live by yourself take care of someone else and be responsible for their happiness or you will become very selfish.Your body does not require meat to survive and be healthy Be of service to the animals and alleviate their suffering. When you eat meat you absorb the pain and terror of the animal into your system. If you truly had compassion would you eat meat? "You must reconcile yourself with the animal kingdom. Your body does not require meat to be healthy. What right do you have to hurt an animal?" The reality of the horror of harming animals pondered by a mothers son. 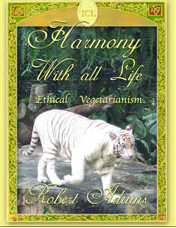 Robert Adams remained a devoted ethical vegetarian throughout his life. He met his beloved young wife in college,with whom he spent his life, a spiritual vegetarian accredited gourmet nutritionist who taught professional compassionate vegetarianism gourmet cooking as a young girl overseas. Her television and radio show introduced the art of delicious, international simple and expertise Ahimsa non violent based cooking for daily life and her cultural traditional of celebrations and warm home hospitality as honored as well in the Indian cultural traditions and temple diet. His gentle wisdom simply reveals non- harm as the nature of the Self. Robert Adams spoke often of her gift in natural cuisine as an art, and together they hosted consistently warm and welcoming large hospitality founded dinners, banquets for international visitors, and weekly feasts for inner circle lifelong students. Their devotion to animal protection, respect and welfare included a myriad of humane causes and organizations, gourmet ethical vegetarian international recipe cook books, and his Teaching of the spiritual significance of compassion in wisdom with The Animal Kingdom, as well as the effect of ingesting meat. "The terror, the pain of the animal is absorbed into your consciousness. In higher ages, the animals and humans lived in harmony. Wisdom. There was no fear. " "Performing vile actions on innocent animals incurs karmas." The renowned saint, Ramana Maharshi, featured in the classic vintage film, The Razors Edge original and later version, is shown realistically in rare video footage revealing his genteel spiritual stature of pure love, respect and devotion for the animals as an expression of Truth. Often misunderstood as 'unattached' or simply 'observing', this path of eternal love manifesting in everyday life as the ultimate compassion in relationship, shows his touching love, care and devotion to his beloved cow on a personal/divine level.. They reveal our true level of compassion. Introductions to the animals of the saint Ramana, represented in the vintage film "The Razors Edge" in tender love and devotion in video narration. A villager had a dream in which he was told to offer his next calf to Ramanasramam. He brought his cow and the calf to Bhagavan. The jungle around the Ashram was thick at that time and there were cheetahs. The Ashram people were perplexed and refused the offer, but the villager was taking his dream seriously and would not take the calf away. The mother cow had to remain with the calf to feed her. Finally, the cow and the calf were entrusted to a devotee in the town. 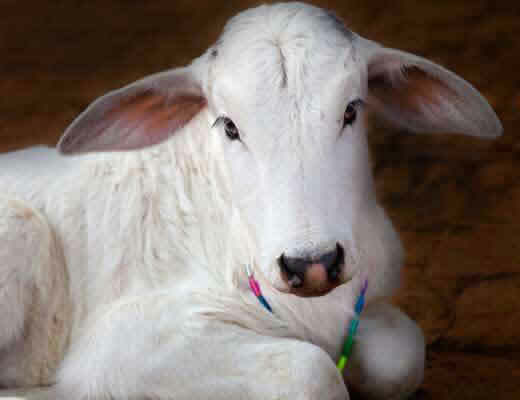 The calf became the famous cow Lakshmi. She grew up and had three calves within a few years. She would come daily to the Ashram to have her meals, graze on the Ashram land, enter the Hall and sit contentedly near Bhagavan. In the evening, she would go back to the town as other women did. Once Lakshmi came into the Hall. She was pregnant at that time. It was after lunch time when Bhagavan was reading the newspapers. Lakshmi came near and started licking the papers. Bhagavan looked up and said: "Wait a little, Lakshmi." But Lakshmi went on licking. Bhagavan laid his paper aside, put his hands behind Lakshmi's horns and his head against hers. Like this they stayed for quite a long time. I stood nearby looking at the wonderful scene. After some ten minutes or so, Bhagavan turned to me and said: "Do you know what Lakshmi is doing? She is in Samadhi." I looked at her and tears were flowing in streams down her broad cheeks. Her breathing had stopped and her eyes were fixed on Bhagavan. After some time Bhagavan changed his position and asked: "Lakshmi, how do you feel now?" Lakshmi moved backward, as if reluctant to turn her tail towards Bhagavan, walked round the Hall and went out. In the roof of the Old Hall, squirrels would build nests. Once, some new-born squirrels dropped on Bhagavan's sofa. Their eyes remained yet unopened and the size of each baby may not have been more than an inch; they were very red in color with fresh flesh, absolutely tender to touch. The mother squirrel ignored them. Now what to do? How to feed and attend to such tender things? The baby squirrels were in the palm of Bhagavan. Bhagavan's face glowed with love and affection for them. While there was a question mark in the faces of those who surrounded Bhagavan, He Himself was happy and cheerful. He asked for some cotton to be brought. He made a soft bed for them. He also took a bit of cotton and squeezed it to such a tiny end, the end portion looked like a sharp pin. He dipped it in milk and squeezed milk into the tiny mouths. At regular intervals, Bhagavan repeated this act of compassion. He tended them with great care and love till they grew up and ran around. They did not run away, only ran around their 'Mother'. Kinder far than their own mother! "On The Nature of Reality- If no-thing existed, you would know not to eat meat before that, and you wouldn't do it anyway. If you realize you are not the body, you would not eat animal bodies. You would eat very little, and mostly grains, vegetables and fruits. But you have to come to that conclusion yourself." "This is a Path of Non Harm to Person Place and Thing. To All of Life. The First Rule is Compassion. Mercy. All Else is Unnatural."